AzhwAr says that those who attain the divine feet of emperumAn who always helps in times of danger, would enjoy his aprAkrutha (not made of the five elements that we are made of) divine form with happiness. piRan enRum – Oh one who carried out great benefits! nALum perum pulari enRum – In this useless, unfruitful materialistic life, during hard times, a day would come when one can enjoy emperumAn! It would be the dawn of a good day! Celebrating such a day just like akrUrar (a minister with the demon kamsan) did when he went to see kaNNan, as mentioned in SrIvishNu purANam 5-17-3 “adhya mE saphAlam janma suprabhAthA cha mE niSA” (Only today my birth became useful! Only today, my night dawned in to a great day!). perum pulari – it has been mercifully mentioned in thiruppallANdu 12 “nallANdu enRu navinRu uraippar” (they will celebrate all the time saying that good times have come). AzhwAr celebrates saying that even for him, who spends his time thinking of lowly creatures, a day has dawned when he could think of emperumAn, worshipping his good time. kurA nal sezhum pOdhu koNdu – emperumAn considers whatever his followers keep at this divine feet as flowers. Don’t only those who worship emperumAn with flowers and attain him get to see his divine form! kurA nal sezhum pOdhu koNdu – since this AzhwAr had constantly travelled only in forests, he says that it is enough if one worships emperumAn with the flowers of kurA tree which is seen only in forests. 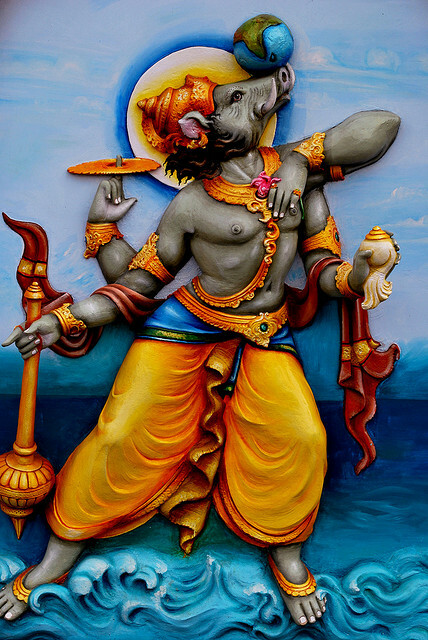 varAgaththu aNi uruvan pAdham – emperumAn assumed the form of varAha (wild boar) which roams in the forest, so that people can worship him with flowers which blossom in the forest. aNi uruvan – since he assumed the form of a great boar, there was no necessity to decorate him with ornaments. His form itself appeared as if it had been decorated with ornaments. If emperumAn can assume any form, it is enough if he can be decorated with any flower. paNiyum avar kaNdIr – SrI bhagavath gIthA 9-2 says “susukham karthum avyayam” (bhakthiyOgam (the practice of devotion) is comfortable to carry out; it does not get destroyed even after yielding the result). In the same way, the path adopted to attain emperumAn is sweetest. The path to get the fruit of enjoying emperumAn is also a benefit. 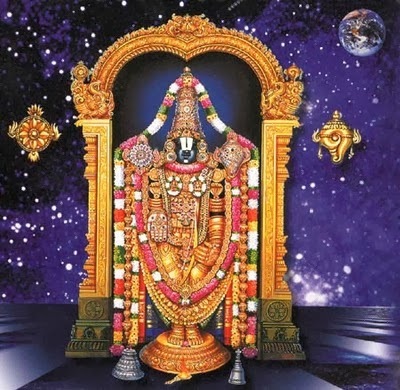 maNi uruvam kANbAr magizhndhu – thus, those who offer flowers to emperumAn will happily get to have vision of his divine form which is cool like a bluish gem. We shall take up the 32nd pAsuram next. This entry was posted in iraNdAm thiruvandhAdhi, iyaRpA on October 31, 2017 by T N Krishnan. Subsequently, emperumAn does not leave even after parAnguSa nAyaki tells him to do so; he smiles gently towards her and her mind becomes weakened seeing that; she says “instead of tormenting us, you go near those who are dear to you and wait for them playing your flute”. Second pAsuram. One [emperumAn] who did not get them to notice him, saw their face; one who could not get them to speak, got them to say “go”; now he is very grateful for that. When she says “go”, he does not just see that word, but knows what is going on in her heart. uyndha piLLai araiyar sang this quoting perumAL thirumozhi 6.8 “innam en kaiyagaththIngu oru nAL varudhiyEl en sinam thIrvan nAnE” (if you still come close to my hands’ reach, I will vent my anger by beating you up), and showing in action, how she will kick him with her feet and push him away with her hands; embAr mercifully heard that and showed him how she would turn her face away from him saying “it is not like that; if he gets such beatings, he will be happy since he is praying for her touch since long; so, that is not the meaning”. He mercifully said “Whatever you did staying away from me, she is saying that she will do it in his presence”. It is well known that, as embAr was totally detached from worldly pleasures, he would learn the specific details about the aspects/emotions of women from singappirAn; piLLai uRangA villi dhAsar would say – such embAr, while explaining “minnidai madavArgaL” decad, would make us wonder “why is this sanyAsi (ascetic) blabbering [romantic aspects] like this”. This is how amazing his interest in matters relating to bhagavAn! Those who are engaged in inferior worldly pleasures, remain blissful; what to speak of the emotions of those who are engaged for a long time in emperumAn who has incomparable auspicious qualities. embAr used to say “in this samsAram where it is rare to find some one who would say ‘come’ (when ISvaran appears in front of them), we have parAnguSa nAyaki who says ‘go’ (since he delayed his arrival)”. AgulangaL seyya azhidhaRkE nORROmE yAm? nambI – Oh you who are complete! nORROmE – have we not vowed? sUduvAr – don’t they have? Oh you who are complete! Go. You are smiling at us; your eyes which are attractive like a lotus flower and the smile manifested in your reddish mouth cause us anguish and we have vowed to be finished [by that]; are those damsels who have hairdo which is similar to expanded feathers of nice peacock, not having your mercy? You play your flute to make them hear the sound to rise and arrive here. [Don’t do it directly so everyone can know your intentions] Drive away the cows far from you, and play the flute after going and staying there. Implies to emperumAn that, don’t think “can I not do the same here?”. pOgu nambI – Since parAnguSa nAyaki is repeating “pOgu nambI“, it implies that emperumAn would have come closer by a couple of steps. [She says] Come on! I don’t know how many other damsels you have touched; stay away so that your clothes don’t touch me. What will one who comes closer when said “go”, feel when said “don’t touch me”? nambI – Would you do what is done by lowly people? Aren’t you desireless? nambI – Are you having any shortcoming to be waiting for us like this? Do you need us? AzhwAr try to finish himself in thiruvAimozhi 4.8 “ERALum iRaiyOnum“, saying “uyirinAl kuRaivilam” (I don’t need this self if not desired by him); but he did not die, since emperumAn is existing. In thiruvAimozhi 5.4 “mAsaRu sOdhi“, AzhwAr tried to finish emperumAn [i.e., emperumAn’s great qualities, by performing madal]; here, when emperumAn arrives, AzhwAr says “gO”; I [nampiLLai] don’t know what is the reason [AzhwAr’s mind is too difficult to understand]. They are saying “nambI” because, he is disqualified to be in that group [of damsels]; where one should be humble, it is not apt to manifest one’s supremacy. un thAmarai purai kaNNiNaiyum sevvAy muRuvalum – The eyes which had become dry due to not seeing her, cooled down and became fresh on seeing her; the internal bliss led to his joyful smile. This is the change in his form on hearing their nectarean words of rejection. In this samsAram where there is no one inviting him to come, it is even more difficult to tell him to leave [out of such great love]. While being in this world where there is no one even to pray to him for worldly benefits, it is rare to see someone who surrendered to him exclusively and go through such emotions due to that. AgulangaL seyya – Agulam means pUsal (romantic quarrel), varuththam (sadness) and dhu:kham (sorrow). While there are two causes (eyes and smile), all the senses are weakening [for her]. For him, it was just one or two features [in his body] which changed; but for them, all the features changed. There is a difference between aNu (miniscule AthmA) melting and vibhu (great paramAthmA) melting. emperumAn asked “you told me that you have nothing to do with me; but you are speaking like those who have emotional attachment with me; this is contradictory! you said ‘pOgu nambI‘; but are also saying ‘AgulangaL seyya‘; what is the reason for this?”. They replied “Oh! Do you think that we are having emotional attachment towards you? Does the chandhrakAnthA stone (moon-stone) melt on seeing the moon due to any emotional attachment? [it is just unavoidable] As said in ‘avaSyamanubhOkthavyam‘ (must be experienced), can we avoid our destiny?”. azhidhaRkE nORROmE yAm – This is our nature. Only when iLaiyaperumAL skips going along with you to the forest, can we avoid our destruction. It is said in SrI rAmAyaNam ayOdhyA kANdam 40.5 “srushtasthvam vanavAsAya” (sumithrA says to lakshmaNa – “you are given birth to accompany (and serve) SrI rAma in the forest”). nOnbu – that which is carried over from previous birth. Hearing them saying that, emperumAn thinks “such destruction will lead to union” and tells them “While you have changed so much on seeing me, why not continue on further?”; they replied “is that what you are thinking! we are not them [those other damsels]! we are destined to finish in this manner!”. yAm – She is saying “there are others who pray to unite with you when separated from you”. He simply stood there manifesting his bliss of hearing them speak for a long time. she thought “our sight is relaxing for him” and turning her face away from him, stepped back; at that time, his heart became attached to her distinguished hairdo. thOgai mA mayilArgaL – she continued to think “he is not going to see our paleness and teary eyes; we cannot stop what he is seeing by divine sanction!”; and that benefited him. Overcoming the destruction caused by his eyes and smile, her survival led to his enjoyment of her. He remained “our goal is completed first” [also explained as, I got to see their hairdo]. As said in SrI rAmAyaNam sundhara kANdam 19.3 “UrubhyAm udharam chAdhya bAhubyAncha bayOdharau” (sIthAp pirAtti sat there with fear covering her body with her hands and thighs [legs]), as she covered her body hiding them from the sight of demonic people, here she is covering herself to hide from the sight of emperumAn. That is how much romantic anger she is having. thOgai mA mayilArgaL – As said in SrI rAmAyaNam sundhara kANdam 15.25 “neelanAgAbayA vENyA” (hair which resembles a dark serpent), he saw her hair which was not cared for; “it does not matter where you are facing; what beautiful hair you have!”. She is very knowledgeable [and having beautiful hair]; since he is desirous [and well aware of the different types of hair], he praises her hair. Those other girls are so great that they make him think on seeing our hair that it is their hair! They said “When one is separated from his dear consort, he sees her everywhere and in everything”. Those damsels who have nice hairdo which resembles the expanded feathers of a peacock. nin aruL sUduvAr – Those who united with you before and are driving you crazy in their separation. Instead of suffering in separation from them, go and unite with them. sevi Osai vaiththezhak kuzhalUdhu – They are as said in perumAL thirumozhi 6.9 “engaLukkE oru nAL vandhu Udha un kuzhalinnisai pOdharAdhE” (would you not come and play your flute for us at least one day); when you play your flute, they will hear that; then they will come. As the serpents came and entered the sarpa yAgam (fire sacrifice performed by janamEjayan to kill all serpents), all the cowherd girls would come and fall at your divine feet! They are waiting to hear the sound of your flute; those who are separated from you have all their senses focussed on you only. When you start playing your flute, will anyone stay away as said in periyAzhwAr thirumozhi 3.6.1 “thUvalampuri udaiya thirumAl thUya vAyail kuzhalOsai vazhiyE kOvalar siRumiyar iLam kongai kudhugalippa udaluL avizhndhengum kAvalum kadandhu kayiRu mAlaiyAgi vandhu kavizhndhu ninRanar” (On hearing the divine flute music of SrIman nArAyaNan who is having sudharSana chakra in his hand, the young cowherd girls broke their barriers, had the protective ropes as garlands, with cherishing youthful bosoms, came running and stood with shyness in front of him)! All of them will come and fall at your feet! So you play your flute – parAnguSa nAyaki. He said “That is not my approach; everyone will complain that I called them by playing my flute to unite with those girls as said in perumAL thirumozhi 6.9 ‘kongu naRum kuzhalArgaLOdu kuzhaindhu kuzhal inidhUdhi vandhAy’ (mingling with girls who have fragrant, beautiful hair and playing flute); it is well known that I play the flute to invite the girls; so I cannot do that”. They said “Alright. Listen. We will give you a good idea”. AgaL pOga vittu – Let the cows go away and then play the flute to call them back. She said “Those who don’t know [your trick] will think that you are playing the flute to bring the cows back; the girls who know your intention, will reach you. And this also matches your family duty. It is said in thiruvAimozhi 6.4.2 ‘thInguzhal UdhiRRum nirai mEyththadhum‘ (Played sweet music in his flute and tended the cattle). So you do that”. emperumAn thought “Now, we have understood the means to be followed; also got instructed on how to practice the means; now, we won’t miss out on the goal; there is no more shortcoming for us”, and started playing his flute. Now, he does not violate the rules; they said “thOgai mA mayilArgaL … sevi Osai vaiththezha” (sing to those girls who have beautiful, peacock feather like hairdo); they did not explicitly identify the location! So, he started playing the flute from there itself. They said “If we give you an idea, why are you trying to play it upon us?”. kuzhal Udhu pOyirundhE – You go and play the flute where you have the opportunity to attract the girls. thOgai mA mayilArgaL – [It appears a SrIvaishNava may have arrived for the upanyAsam [lecture][ a bit late; so nampiLLai starts and explains it again] Since emperumAn is greatly knowledgeable [well aware of the types of hair], he started praising; they think “since he does not understand whose hair it is, he is praising without knowing – he is talking like a mad man”. They are discarding his best speeches [or his speeches about their hair]. sevi Osai vaiththezha – Having the music from the flute in their ears and arriving there. AgaL pOgavittuk kuzhal Udhu – You send the cows and then play the flute. When you play the flute, your goal will be achieved and the cows too will have their stomach filled [by your divine flute music]. He said “their having the music of flute in their ears and rising is the result; my playing the flute is the means; should I not do it for my dearest persons? Let me sing staying right here” and started playing the flute. pOy irundhE kuzhal Udhu – When we say one thing, you don’t do something else; you go to fertile lands where your dearest ones will assemble, stay there and play the flute. This entry was posted in thiruvAimozhi, thiruvAimozhi 6th centum on October 30, 2017 by Sarathy Thothathri. In the previous pAsuram AzhwAr mentioned about the victories of kaNNan and Sri Rama. In this pAsuram he celebrates [emperumAn’s ] other incarnations and his activities. pErOdham mEnip pirAn – Oh benefactor who has the divine form like a huge ocean! nINda thirumAlE – Oh thirumAl, who has fame beyond one’s thoughts! nI anRu ulagu aLandhAy – sages say that you made yourself as a mendicant, approached mahAbali, who becomes joyous on donating anything, got the worlds as alms from him and measured them with your divine feet. Since AzhwAr spoke in the previous pAsuram about krishNAvathAram in which he moved with everyone without bothering about whether they were high or low in status, mentions in this pAsuram about thrivikrama, who touched the heads of everyone with his divine feet [without any distinction]. 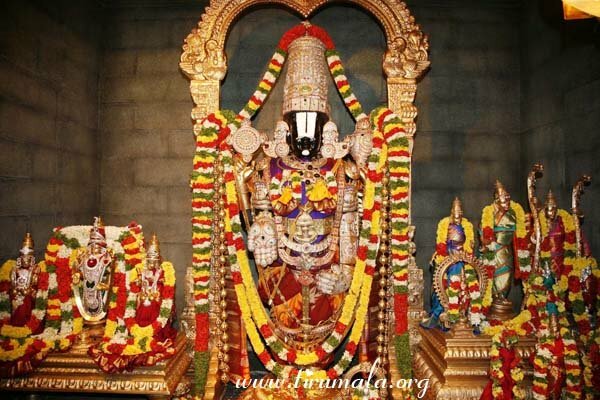 nINda thirumAlE – Oh the consort of SrI mahAlakshmi, and who is beyond any measurement. nInda thirumAlE – you measured the earth which you got as alms and which appeared as if it was something which you could never have got otherwise. You, who are immeasurable, made yourself to be measured by others through this act! In other words, you, the consort of mahAlakshmi, who is the owner of all wealth, made yourself into a mendicant and a bachelor! nI anRu ulagu idandhAy enbarAl – sages say that since there was none from whom you can ask for alms when the world was being submerged during praLayam (deluge), you took the form of a boar which roams around in water and marshy lands, to release the earth which had got stuck to the walls of the universe and to dig out. nI anRu kArOdham mun kadaindhu pin adaiththAy – mention is made of his activities for pirAtti (SrI mahAlakshmi). AzhwAr reminisces about the activities which he carried out for others and for mahAlakshmi without any difference. When indhra (head of celestial entities) and others surrendered to you after losing all their possessions due to the curse of sage dhurvAsa, you churned the great, black coloured ocean, first to get SrI mahAlakshmi and then blocked it (by building a bridge over it during rAmAvathAram). pin adaiththAy mA kadalai – you blocked the ocean, which you churned [initially] for the sake of pirAtti, again for the sake of pirAtti. pEr Odha mEnip pirAn – the one who has the complexion of ocean, churned the ocean. During the time of churning as well as during the time of blocking, it appeared as if one ocean was shaking another. pErOdha mEni – the ocean would appear like a pond when viewed against emperumAn. pErOdha mEnippirAn nI anRu ulagaLandhAy – Should one measure the world which are composed of forests and craters, with a beautiful form matching ocean! We shall take up the 31st pAsuram next. This entry was posted in iraNdAm thiruvandhAdhi, iyaRpA on October 30, 2017 by T N Krishnan. Since AzhwAr spoke about krishNAvathAram [incarnation as krishNa] through mA vAy piLandha in the previous pAsuram, he becomes bewildered, being involved with that avathAram. maganAgak koNdu eduththAL – pUthanA, carried you skilfully just as a real mother would lift her infant, without displaying any difference. While you were born in SrI mathurA, as the son of vasudhEvar, and grew up in thiruvAyppAdi (SrI gOkulam) as [nandhagOpar’s] son, puthanA also acted as if you were her child. agan Ara uNban enRu uNdu – Just as pUthanA lifted you [as her son] without displaying any difference, kaNNan (krishNa) also drank milk as if he were nursing from his mother’s bosom, without displaying any difference. His position was very much similar to pUthanA’s. Just like she could not sustain herself without nursing him, he too drank her milk as if he could not sustain himself without that. He drank such that his stomach would feel contented. maganaith thAy thERAdha vaNNam thiruththinAy – you acted in such a way that your mother, yaSOdhA, will not have any trust in you. If someone says “son”, it will refer only to you, just as it would refer only to yaSOdhA if someone were to say “mother”. Just like it would refer to dhaSaratha chakravarthy if someone says “affection towards son”, this is similar to that. You acted in such a way that your mother would start fretting as to what would happen to you, seeing you drinking poisoned milk from a demonic woman. You acted such that she would fret thinking about this, even after you had grown up. Alternatively, you acted such that no mother would believe her son henceforth. In other words, you acted in such a way that after giving birth to you, your mother yaSOdhA was scared that she had lost you, since you were in the hold of pUthanA. thiruththinAy – you touched her. thennilangai nIRAga eydhu azhiththAy nI – The act of burning lankA to ashes was carried out when [SrI rAma had] matured into a man, displaying his valour. AzhwAr is worried that suckling pUthanA was done when he was still an infant, before maturing of age. Did he carry out that act when a parent would feel proud that his/her son had gone to the battlefield and would return victorious (like SrI rAma)? Did he not do that act of suckling pUthana, as an infant! 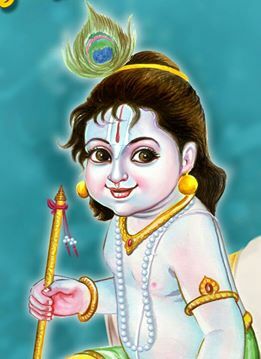 If one were to think about rAmAvathAram, one could keep his hand on the chest (and be without any fear) just as it is mentioned in nAnmugan thiruvandhAdhi “kUrambanallAl” (no one other than the one with sharp arrows (SrI rAma)). 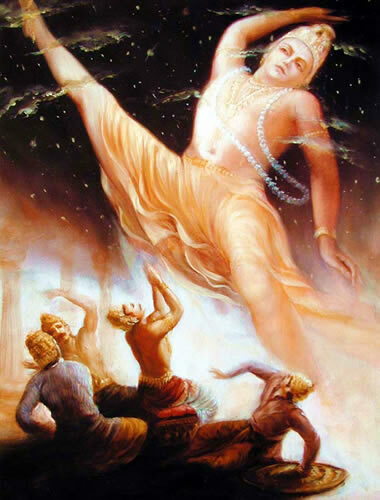 You [referring to krishNa] who had the fame as mentioned in SrI rAmAyaNam ayOdhyA kANdam 44-7 “kIrthibhUthAm pathAkAm yO lOkE bhramayathi prabhU: kinnAma dhurlabhAm thasya” (what is it which cannot be attained by Sri rAma who let fly his flag called fame! ), you who had carried out deeds with a bow in your hands, blowing lankA to smithereens, carried out an act which made your mother not trust her child. We shall take up the 30th pAsuram next. This entry was posted in iraNdAm thiruvandhAdhi, iyaRpA on October 29, 2017 by T N Krishnan. First pAsuram. emperumAn delayed his arrival not because he can live without parAnguSa nAyaki; he arrived quickly, picked up the ball and anklet, stood there being grateful for finding a rare treasure and manifested all the love he has towards her on them. Seeing his emotions, parAnguSa nAyaki thinks “he is not doing this for us; he is doing all this thinking that these are the possessions of those he united and separated; why should I not talk to him?” and says “Come on! These are not owned by those who you think about; they belong to us who are discarded by you; you return these to us and go to them”. He says “OK! I shall do it”. He said “it appears that a cloud [ parAnguSa nAyaki‘s beautiful upper body] is held by a lightning [her slim waist]”, and parAnguSa nAyaki and friends said “minnidai madavArgaL” [reminding emperumAn about the other damsels]. Considering him to be going towards those damsels and saying these things in between to them which is temporary, they said “If you spent too much time for us who don’t like you, those many damsels who like you will torment you greatly. What is their nature? What amazing qualities they have in their physical body and soul!”. man udai ilangai araN kAyndha mAyavanE! unnudaiya suNdAyam nAn aRivan ini adhu koNdu seyvadhen? ennudaiya pandhum kazhalum thandhu pOgu nambI! man udai ilangai arN kAyndha – For us, is there any one other than you! emperumAn asks “Haven’t you heard about my previous incarnation where I was an EkadhAra vrathan (married and committed to only one wife) and I had eliminated the hurdles [of the devotees]. mAyavanE – Oh such emperumAn who is having the mischievous form to deceive the young girls and captivate them! en – is there anything? Damsels have lightning like slim waist and hence do not have any shortcoming in beautiful form, and humility etc which are qualities of the soul, and have acquired your mercy. I who know your actions towards them, in their presence, fear about this act of yours which will make them shy away from you, to weaken you. emperumAn asks “Haven’t you heard about my previous incarnation where I was an EkadhAra vrathan (married and committed to only one wife) and I had eliminated the hurdles [of the devotees]?” Oh such emperumAn who is having the mischievous form to deceive the young girls and captivate them! Unlike others, I know your thoughts, know your selfish nature. Is there anything to do now with that? While only I am missing [in the group of persons protected by you], return the ball and anklet which are considered to be owned and possessed by me, and go. She thought “he will give up the possessions of those who claim ownership”; but emperumAn thought “her facing off is due to her overwhelming love, so whatever is related to her, is desirable for me”. Ball is made of red, black and white threads [prakruthi which is made of three qualities – rajO, thamO and sathva guNam], and anklet has five metal pearls in it [indicating the five senses]. He liked them desiring to take ownership of AzhwAr‘s body which is made of the three qualities and the five senses; she asked him to return the same indicating that if she does not attain him, she will remain with the previous body and senses [in this material realm]. minnidai – Sample for all other qualities of their physical form. madavArgaL – This is a sample for the virtues of the soul such as nANam (shyness), madam (humility), achcham (fear) and payirppu (modesty). By the plural in madavAr – his non-commitment to a single woman is highlighted. They make you bewildered and confuse us with them. She is assuming their beauty by his anguish. Oh my bad! Who made you torment thinking about their waist? minnidai madavArgaL – How amazing that AzhwAr is praising the virtues of the physical form and the soul of those who are related to him as SubhASrayam (auspicious target)! Though she is having romantic anger externally, internally she is happy for him only. Even if one thinks parAnguSa nAyaki is having hatred in her heart, she can only speak the truth [about those damsels who are dear to emperumAn]; even while speaking out of hatred, sUrpaNakA could only say as in SrI rAmAyaNam AraNya kANdam 19.14 “tharuNau rUpa sampannau” (youthful, well grown). minnidai madavArgaL – They (parAnguSa nAyaki and friends) very well know, when emperumAn comes to them, he says “what a beautiful waist! what wonderful qualities you have!” and becomes engrossed in these aspects; so they think “even when he goes to these other damsels, he would tell them the same”. Otherwise, she has not seen the others [so, she is saying based on assumption]. nin aruL sUduvAr – Those who are target of your mercy. At this stage, it is apt for her to say “those who are qualified [greatly fortunate] to place their feet on your head”; but she would not say that; because that will give him further opportunity; that is, he will take her feet and place them on his head. She who is not even manifesting their relationship [due to anger], would not say that. Since it is a union out of attachment [of parAnguSa nAyaki towards emperumAn], their thoughts too arise out of emperumAn’s desire and since there is no explicit question from emperumAn, we have to assume that emperumAn raised a question. [emperumAn asks] Alright! But they are not here [why are you speaking about them]! munbu – You treat us like them. She is telling “we are not different from them”. While she should have said “Whatever they have, I have them too”, why is she talking about others? emperumAn who is waiting to develop the conversation, will not stop with one statement then; he sustains himself by engaging them in conversation. munbu – [in front of them] whatever you do cannot be concealed. We know whatever you did there; similarly whatever you do here will also be known to them. See, for them, there is no external seeking out, like you are doing. Don’t think about them like yourself. Those who united with you and separated from you, will constantly have your image in front of them; they remain as said in periya thiruvandhAdhi 50 “pirindhonRu nOkkAdhu thammudaiya pinnE thirindhuzhalum sindhanaiyAr” (those who are constantly thinking about you and not looking at anything else after getting separated from you). Since they have nothing else to think about, you are their only focus. emperumAn said “So what, when you say that you have no relationship with me, how does it bother you?”. nAn adhu anjuvan – We are not like you. If you spend a little extra time here and get delayed there, and if they face off from you even for a fraction of a moment, you will be anguished and suffer; I cannot bear that; only you can separate after uniting and can see others suffer; we cannot bear the suffering of others [emperumAn]. Though we say that we are not related to you, we cannot bear your suffering; when some one falls into a well and cries out for help, should we be related to them to feel sorry for them? She is saying that she cannot tolerate emperumAn’s suffering in facing off with the other damsels. emperumAn said “I cannot survive without you even for a fraction of a moment; why are you portraying me as a liar and an outsider and speaking like this?”. man udai ilangai araN kAyndha mAyavanE – She asked “Why! Are you not a liar?”. He asked “With those who engaged with me, whom did I lie to?”; she asked “who did you ever remain truthful to?”; he replied “why are you saying like this? As said in nAchchiyAr thirumozhi 11.7 ‘uNNAdhu uRangAdhu oru kadalai UdaRuththu’ (Without eating and sleeping, cutting through the sea), I remained an Eka dhAra vratha (committed to one wife) and suffered; were they all false?”. She replied “Did you do it with full-heart? Did you not do it thinking ‘if I don’t even protect my wife, all other women cannot be captured by me as a group’? Was that not a trick to capture the helpless women?”. man udai ilangai araN kAyndha – Destroyed the town of the crook, where the town by nature instills valour in the citizens – destroying those who lived there; moreover, it is the town which was protected by rAvaNa like a lion’s den as said in SrI rAmAyaNam sundhara kANdam 1.39 “lankAm rAvaNa pAlithAm” (lankA which is protected by rAvaNa) – destroyed such town. man udai – having mannan (king). mAyavan – One who is having mischievous activities. unnudaiya suNdAyam nAn aRivan – You only remain truthful towards those other damsels who are truthful to you; I know all your actions from the beginning; it is sIthAp pirAtti, the divine daughter of king janaka who remains “whatever you do is truthful”; I know your mischievous activities. emperumAn said “How does it matter whether you know about my mischievous acts or not; my task [of talking to you] is accomplished”. ini adhu koNdu seyvadhu en – He said “My task is accomplished”; she replied “there is no benefit of such accomplishment” [he says “I have made you talk to me”; she says “there is nothing more happening beyond the talk”]. ennudaiya pandhum kazhalum – He greatly cherished the ball and the anklet which were touched by her. She said “My bad! What are you doing to those ball and anklet, which should be done elsewhere? They do not belong to those who you think; they are mine”. He said “That is true”; that is what he desires too. As said in mahAbhAratham udhyOga parvam “yasyaithE thasya thadhdhanam” (to the one who owns a person, his property also belongs to the same owner), everything else will become emperumAn‘s possession subsequently. Now, in the pravESam (introduction of this decad), there was a passage about parAnguSa nAyaki wanting to finish herself; that is seen in this word “ennudaiya” (mine). In his presence, there is nothing more devastating than claiming ownership [of his properties]; it is said in SrI pAncharAthram “dhvayaksharasthu bhavEn mruthyu:” (the two syllable word, mama (mine) leads to death). For SrI bhagavath gIthA 1.1 “mAmakA pANdavaS chaiva” (my sons and pANdu’s sons), siRiyAththAn’s explanation – He differentiated between his own sons and pANdu’s sons. That led to total devastation. This principle is not just philosophical, but even applicable between lovers; while in union, one should not say “this is mine, this is yours”, which will lead to break in relationships. ennudaiya pandhum kazhalum – As said in “AthmathyEvathu gruhNIyAth” (one should meditate on paramAthmA considering him as self), during meditation upon brahmam, there is so much proximity that jIvAthmA and paramAthmA appear to be one. When one’s knowledge expands fully, there is no difference between saying “nAn” (I) or “adiyEn” (humble I – servitor). thandhu pOgu nambI – You are delaying here; they would start disliking you without understanding the reason; you better go before that. nambI – You are not familiar to me and you also remain a leader; so you better go there quickly. periya mudhaliyAr (ALavandhAr) explains “It has been so long since they had been together which makes her say like this [that she does not even remember him]”. She said “ennudaiya pandhum kazhalum” to make him drop them. And she said “thandhu pOgu” to indicate that she can survive only with those objects that are liked by him. nambI – As said in SrIvishNu purANam 5.31.17 “shOdaSasthrI sahasrANi” (krishNa is married to sixteen thousand one hundred women), wherever you go, there is no lack of enjoyment for you, but we won’t have you; now, we have to survive by keeping the objects which were touched by you; hence, you give them to us and leave. Like those who say “preserve my life and go”. Knowing well that he will not leave them and go, she says “give them and go” since she knows the inner heart of emperumAn. This entry was posted in thiruvAimozhi, thiruvAimozhi 6th centum on October 28, 2017 by Sarathy Thothathri. As AzhwAr’s divine mind started engaging with emperumAn this way, emperumAn, instead of dwelling at places that he had seen, even though they were all suitable, chose to keep AzhwAr’s divine mind as his dwelling place, and entered it. He did not go to any other place, deciding to remain in AzhwAr’s divine mind. In other words, this pAsuram says that as soon as AzhwAr desired emeprumAn’s inseparable place of SrIvaikuNtam, emperumAn desired AzhwAr’s divine mind. manaththu uLLAn – he is permanently residing in my mind. manaththuLLAn – Just as periyAzhwAr had mercifully mentioned in his periyAzhwAr thirumozhi 5-4-10 “idavagaigaL igazhndhittu enpAl idavagai koNdanaiyE” (leaving aside all other dwelling places, you decided to stay in my heart), emperumAn left all other places and entered AzhwAr‘s mind. vEngadaththAn mAkadalAn – just before entering AzhwAr’s divine mind, the places where he had taken residence – thiruppARkadal and thiruvEngadam (it is implied that he had taken residence in those places only to attract AzhwAr and through those places he entered AzhwAr’s divine mind). Just as he had taken residence at thiruppARkadal before standing in thirumalai, in order to enter AzhwAr’s mind, he stood in thirumalai. maRRum ninaippariya nIL arangathth uLLAn – unlike thiruppARkadal or thirumalai, one cannot say thiruvarangam (SrIrangam) in one word. It is very sweet and very huge and suited emperumAn’s reclining. He reclines in this place as if to tell everyone that he will not leave this place until he attains everyone and seems to be staging a protest! Just as it is mentioned in thaiththirIya upanishath “aprApya manasA saha” (the words returned with the mind, being unable to measure emperumAn), it may be possible to measure emperumAn’s auspicious qualities, but it is impossible to measure the sweetness of thiruvarangam. nIL arangam – very expansive temple. enaip palarum dhEvAdhi dhEvan enappaduvAn – vEdhas (sacred texts) and vaidhika purushas (those who practice vEdham) say, as in SvEthAsvathara upanishath “thamISvarANAm paramam mahESvaram” (you are the Lord of all the Lords) and as in thiruvAimozhi 1-1-1 “ayarvaRum amarargaL adipathi” (he is the Lord of nithyasUris who do not forget anything). paNdorunAL mAvAy piLandha magan – earlier, when he incarnated as krishNa, he, as a child, had torn the mouth of a demon by name kESi. Or, one who incarnated as a human being. Since he destroyed kESi, AzhwAr says that emperumAn removes the enemy who is a hurdle in emperumAn entering his heart. One who is called the Lord of all Lords, one who is in thiruppARkadal, one who tore the mouth of a demon, one who reclines in thiruvarangam which is beyond anyone’s thoughts, one who resides in thiruvEngadam, entered my heart. One who is the Lord of nithyasUris, one who reclined in thiruppARkadal in order to protect the worlds, who incarnated as kaNNan, who destroyed kESi, the demon, who is the Lord of all Lords, who is reclining in the immeasurable thiruvarangam, one who is staying put at thiruvEngadam instead of moving here and there, desired my heart and instead of going to any other place, took permanent residence there itself, says the AzhwAr. We shall take up the 29th pAsuram next. This entry was posted in iraNdAm thiruvandhAdhi, iyaRpA on October 28, 2017 by T N Krishnan. AzhwAr says that once he reached the dwelling place of emperumAn [thirumalai] his divine mind went running towards emperumAn just as a creeper would go in search of a supporting pole. In the previous pAsuram, AzhwAr spoke about how emperumAn dwells in thirumalai and mercifully showers his grace. Since that abode is in archAvathAram (emperumAn in deity form), he cannot interact with emperumAn fully. He says that his heart runs searching for emperumAn in paramapadham (SrIvaikuNtam) so that he can interact with emperumAn in all the ways he liked. padhi amaindhu nAdi – standing aptly in thirumalai. Ensuring that this is the place to be attained. padhi could also be construed to mean ‘heart’ and as said in SrI rAmAyaNam ayOdhyA kANdam 31-25 “aham sarvam karishyAmi” (lakshmaNa told SrI rAma that he would carry out all services), the heart also affirmed. gadhi miguththu – increasing its speed. If the text is taken to be kadhir miguththu it will mean increasing its radiance. angOl thEdi Odum kozhundhadhE pOnRadhE – it is similar to a creeper going in search of a beautiful supporting pole. mAl thEdi Odum manam – it is the way the mind is, going head over heels, looking for emperumAn. mAl – one with affection. Like the river kAvEri breaching its banks and running wildly, my mind is running in search of emperumAn who is full in all aspects and who is greater than everyone else. mAl thEdi Odum manam – nammAzhwAr, in his thiruvAimozhi 9-3-7, has mercifully said “mAga vaikundham kANbadhaRku en manam Ekam eNNum” (to see the paramAkASam (the supreme sky) or SrIvaikuNtam), my mind will think in a focussed way). We shall go on to the 28th pAsuram, next. This entry was posted in iraNdAm thiruvandhAdhi, iyaRpA on October 27, 2017 by T N Krishnan. Since AzhwAr spoke about thirumalai in the previous pAsuram, the thirumalai hill attracted him more. His divine mind goes to it and he speaks about the wealth in thirumalai. paNdu amararkku Indha – the place which he gave to the ancient dhEvas, nithyasUris. vandhiththu – praising emperumAn. Without any ego, attaining emperumAn. vazhi ninRa aimbhUtham aindhum agaththu adakki – controlling inside the evanescent body those matters which are hurdles in attaining emperumAn, without letting them go through the senses such as ear etc. aimb hUtham aindhum – being victorious over the five elements and the five sensory perceptions. undhip padi amarar vElaiyAn – emperumAn, who is reclining in thiruppARkadal (milky ocean), who is attained by dhEvas such as brahmA et al, with each pushing the others [as if in a competition, to attain emperumAn first] and worshipping him. paNdu amararkku Indha padi – this could be construed in two ways: (1) given to the long standing nithyasUris (permanent dwellers of SrIvaikuNtam); (2) given earlier to nithyasUris. What was given to the nithyasUris? padiyamarar vAzhum padhi – thirumalai where the dhEvas of bhUlOkam, SrIvaishNavas (followers of emperumAn who dwell on the earth); thirumalai where they live in total experience. [parASara] bhattar (son of kUraththAzhwAn, one of the primary disciples of bhagavadh SrI rAmAnujar) told piLLai amudhanAr that this pAsuram should be read as: vazhi ninRa aimbhUtham aindhum agaththadakki ArvamAy vandhiththu undhippadiyamarar vElaiyAn padiyamarar vAzhum padhiyAnadhu paNdu amararkku Indhadhu. We shall take up the 27th pAsuram next. This entry was posted in iraNdAm thiruvandhAdhi, iyaRpA on October 26, 2017 by T N Krishnan. In the previous pAsuram it was mentioned that emperumAn stands for all. In this pAsuram his bias towards his followers is mentioned. vEy Ongu thaN sAral vEngadamE – at thiruvEngadamalai with cool, mountainous sides and tall bamboo shoots. senRadhu ilangai mEl – this says that unlike rAvaNa who sent [his uncle] mArIcha as a deceptive deer and made rAma to travel a long distance behind it in order to capture sIthAppirAtti in a cunning way, [SrIrAma] in keeping with his valour, went directly to lankA, waged a war and destroyed rAvaNa. senRadhu ialangai mEl sevvE – instead of through his sankalpam (vow), he went directly to lankA walking with his divine feet. As mentioned in SrI rAmAyaNam yudhdha kANdam 1-29 “abhiyAthA” (one who fights in the forefront), SrI rAma went in the forefront of his army and fought. ilangai mEl – he invaded fearlessly on lankA, a place which entities such as indhra et al would be scared even to mention by name. 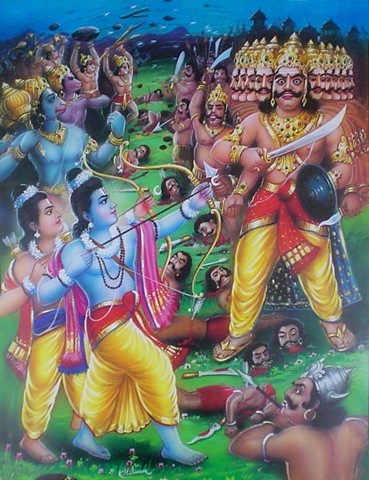 than sIRRaththAl konRadhu irAvaNanai – with his anger, he destroyed the heads of rAvana, who, as mentioned in SrI rAmAyaNam yudhdha kANdam “praharthA cha” (one who attacks) was protected by various boons. than sIRRaththAl – one who has anger under his control. He sought anger and destroyed rAvaNa. He could carry out tasks with his sankalpam (vow) only if he were with the nature of paramporuL (supreme entity). In rAmAvathAram (incarnation as SrI rAma), since he had truly assumed the characteristics of a human being, he destroyed rAvaNa with his anger alone. ninRadhuvum vEy Ongu thaN sAral vEngadmE – in order to help those who had missed out during his various ages of incarnation so that they do not lose out, the place where he came down to is thirumalai (thiruvEngadam) with its cool, hilly sides which remove the tiredness of those who climb the hills, and with well grown tall bamboo shoots. ninRadhuvum vEngadamE – He has come to thirumalai so that he can remove the enemies of his followers who had come after the times of his incarnations. Just as he redeemed sIthAppirAtti who was captured by rAvaNa, he is remaining at thirumalali in order to redeem the AthmAs (souls) which have been stolen by chEthanas who claimed them as their own. viNNavar tham thol pugazhAn – this mentions the place that he had dwelled in, before coming to thirumalai. 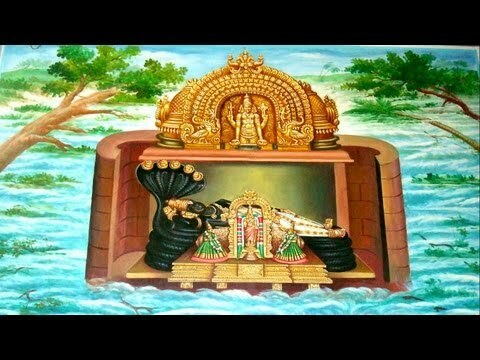 He is one who has natural greatness, and is praised by the nithyasUris in SrIvaikuNtam. We can also construe this as one who has long established qualities, praised by nithyasUris. Or, since the context is SrI rAmAyaNam, we can consider this as the praise of brahmA et al who said, as in SrI rAmAyaNam yudhdha kANdam 117-27 “sIthA lakshmi: bhavAn vishNu:” (sIthA is SrI mahAlakshmi and you are vishNu). 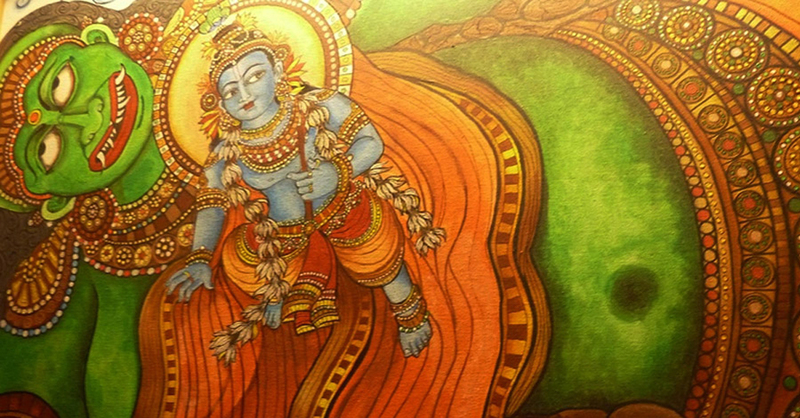 vandhu – he came as the one who seeks to offer himself, to thirumalai. We shall take up the 26th pAsuram next. This entry was posted in iraNdAm thiruvandhAdhi, iyaRpA on October 25, 2017 by T N Krishnan. AzhwAr says that after the jIvAthmA was created, emperumAn has given him everything. Is it something great? He says, right from the beginning, did not emperumAn carry out everything for him, including his existence! nal nenjE – Oh (my) good heart! avan kaNdAy nannenjE AraruLum kEdum – it is not the chEthana’s (sentient entity) efforts which are the reason for his uplifting. It is emperumAn’s mercy alone which is the reason for the chEthana getting various benefits. It is not merely the activities of the chEthana, but the causeless grace of emperumAn which leads to benefits for the chEthana. It is emperumAn’s anger which again is the reason for the difficulties experienced by the chEthana. Thus, for whatever benefits or difficulties that the chEthana gets, it is emperumAn’s grace and anger which are the reasons. There is no puNya or pApa beyond this. We can also say that it is emperumAn’s mercy which is the reason for the chEthana getting mOksham and his anger, for the chEthana getting samsAram (repeated births in materialistic realm). nannenjE – Oh heart who agrees with humility when told that emperumAn is the cause for both puNya and pApa. Oh heart who is apt to listen about emperumAn. avan kaNdAy aimpulanAy ninRAn – It is he who creates a thought in us that he is needed for us. It is he who exists as our sensory perceptions which determine whether we do or do not attain him. The senses will be under his control whether we say that we exist and emperumAn doesn’t or if we accept that emperumAn exists. It is he who kindles the sensory perceptions to engage with worldly pursuits and leads us astray or makes the sensory perceptions to engage with him and protects us. Both the chain (with which to tie us down) and the crown (with which to take us to glory) are in his hands. He has mercifully said in SrI bhagavath gIthA 10-10 “dhadhAmi bhudhdhiyOgam tham yEna mAmupayAnthi thE” (I give you intellect which is the means for attaining me). He has also mercifully mentioned in SrI bhagavath gIthA 16-19 “thAnaham dhvishadha: krUrAn samsArEshu narAdhamAn kshipAmi ajasram aSubAn AsurIshvEva yOnishu” (I always push those who hate me, who are cruel, who are the worst among the men and who are inauspicious, into samsAram (materialistic realm) and that too in demonic birth). 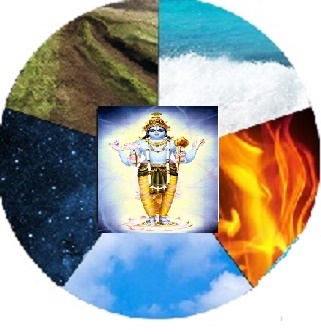 avan kaNdAy kARRuth thI nIr vAn karuvarai maN – it is he who creates these with the help of the five elements, which are responsible for the chEthana losing emperumAn. kARRuth thI nIr vAn – since it is the physical body which is a hurdle for attaining him, it is he who gives the body and nurtures samsAram. As said in SrI bhagavath gItha 7-14 “dhavIhyEshA guNamayI mama mAyA dhurathyayA, mAmEva yE prapadhyanthE mAyAmEthAm tharanthithE” (this prakruthi (matter) which is composed of the three qualities [sAthvika or good, rAjasa or passionate and thAmasa or ignorant) has been created by me. This cannot be overcome by anyone on his own efforts. Only those who surrender to me will be able to overcome it), we have to surrender to him and sever our connection with this worldly life. kARRuth thI nIr vAn karuvarai maN – It is he who creates the five elements and the huge mountains which are responsible for creating the body with which one can attain either life in this samsAram or mOksham. kArOdhach chIRRath thI AvAnum senRu – at the time of total annihilation [deluge] at the end of the yuga (age), it is he who manifests as the huge fire which destroys all these entities. 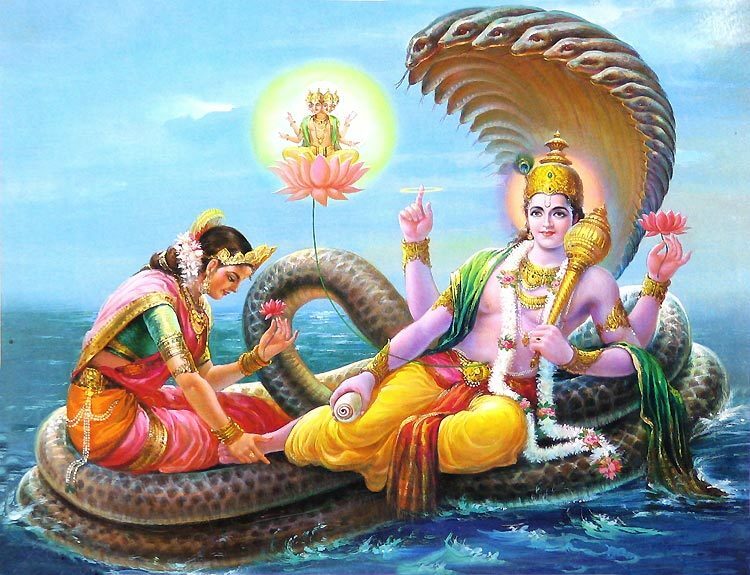 kArOdhach chIRRaththI is the fire called as patapAgni which forms in the middle of the ocean. In other words it is the fire which burns water (which would normally put out the fire)! Thus, it is he who controls those which are to be given up and which are to be attained. Let us move on to the 25th pAsuram next. This entry was posted in iraNdAm thiruvandhAdhi, iyaRpA on October 24, 2017 by T N Krishnan.